Recent discoveries have validated immune cell targeting as a relevant approach to fight human cancer. Most notably, T cells are a key component of the tumor microenvironment and therapeutically activating them can durably control various cancer types. Yet, because current immunotherapies only benefit a minority of cancer patients, there is an urgent need to understand why some patients do not respond to treatment and find new approaches to improve cancer control. Considering the initial success obtained with targeting T cell-associated inhibitory pathways (e.g., PD-1, CTLA4) an active line of investigation consists of identifying additional T cell regulators that could be manipulated for therapy. Another strategy encompasses approaches designed to identify whether immune components other than T cells represent additional significant therapeutic targets. These approaches reflect the diversity of immune cell types found in tumor microenvironments and their interplay with progressing tumors and response to various cancer therapies. The Cancer Immunotherapy Program at CSB, directed by Mikael Pittet, PhD brings together investigators who conduct basic and translational research on the immune system and emphasize the use of in vivo systems biology and imaging approaches to interrogate how various immune components behave in complex environments. Major goals are to uncover key mechanisms regulating cancer-associated adaptive and innate immune cells (beyond T cells) in the tumor microenvironment and identify new immuno-oncology therapies that stimulate antitumor immunity against a broader range of tumors. Program members working within CSB maintain strong ties with local (MGH Research Institute, Harvard, MIT, Broad), national and international investigators. The growth of a tumor and its ability to progress and metastasize is influenced by a variety of host components, including various stomal and immune cells. Precisely how the microenvironment influences tumor outgrowth remains poorly understood. This Program utilizes recent advances in molecular imaging, nanoscale materials and gene profiling efforts to quantify and model cellular and molecular immune components of the tumor microenvironment. The approaches are aimed to discover fundamental aspects of immune responses to cancer and establish new paradigms for future translational efforts. Additionally, the Program investigates tumor-driven mechanisms that modulate immune cells in the entire body. This important considering that some tumors affect immune cell components well beyond the local tissue microenvironment and that immune cell subsets in various body compartment can regulate tumor cell dissemination and metastasis. The first wave of immuno-oncology therapies has revolutionized cancer treatment by successfully demonstrating that enhancing antitumor T cell activity controls some cancers durably and provides impressive survival benefits. Considering that tumor microenvironments are home to diverse immune cell types, including cells other than T cells, it is a critical time to uncover whether additional immune components are relevant next generation immuno-oncology targets. This Program specifically explores ways for stimulating both adaptive and innate antitumor immunity, and methods for rationally identifying effective new drug combinations. 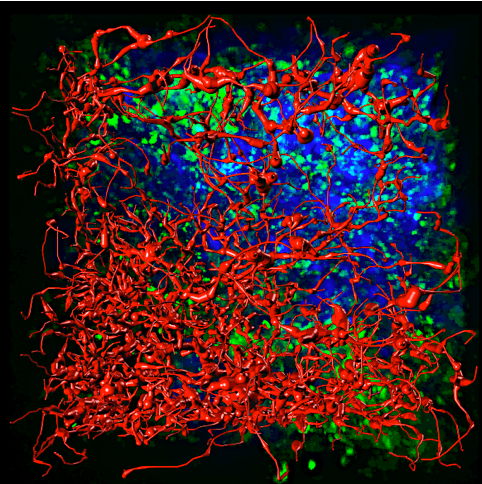 The Program also uses new reporters and imaging tools to uncover how drugs affect immune cells in real time in vivo. By considering multiple immune cell types and examining drug response and resistance mechanisms, the Program aims to define new therapeutic interventions that stimulate immunity against a broader diversity of tumors and improve the quality of life of more patients. Targeting resistance barriers contributed by several tumor-associated host components may be particularly relevant for patients who resist T cell immune checkpoint blockade treatments. 2018-04-04: The work of Pittet Lab is featured in The Scientist - "Macrophages Play a Double Role in Cancer". 2017-12-01: "Tumors talk to bones, and bones answer back" - Study by Engblom, Pfirschke et al. from the Pittet Lab is featured in Science and Nature. See also interview with the authors. 2017-09-11: "Uncovering Cancer" - the work of Pittet Lab is featured in Nature Medicine article. 2017-06-05: CSB work is profiled in MGH Research Institute spotlight "Mass General Researchers Investigate the ‘Big Eaters’ of the Immune System: #MacrophageMonday"